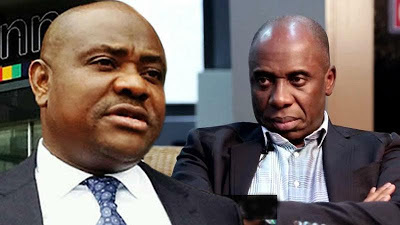 The cold war between Minister of Transport and former Rivers state governor, Rotimi Amaechi and his successor, Nyesom Wike, has taken a new twist as both men are about to attack their wives verbally. “The man who says he has about $50m in Lagos and could no prove it is the same man you believe. The man who said I didn’t pay salaries until I left office and now he is saying no, it is pensioners that I didn’t pay. Do you believe such a man? Do you think such a man is well? You believe Nyesom Wike is well? First, he doesn’t know how to speak English, he is poorly dressed, he is a thug, and you bring me to focus with that kind of a man? "he said.